This article lists my learning from Prof. Ram Kumar’s Marketing sessions and my thought extrapolations on the same. The professor left us with a few ideas and hints to provoke our thinking. This article is an attempt to finish the thought that he kindled. How much does the same person spend for a shirt, T-shirt or a top? Say Rs. 500 to 700. And how much does he/she spend on the undergarments? Hardly Rs 30. The discrepancy is for all to see. People spend 70% of their life in their undergarments. Some people spend even more time in them; they take them off only during ablution and defecation. The undergarments are essential for our comfort and hence make the foremost contribution towards making us confident. If you doubt the confidence part then try wearing a misfit. Also, wearing a good quality undergarment prevents you from so many disorders. And yet we spend so less on them than the outer clothing we wear. Isn’t this ‘individuality’ and ‘healthful living’ a marketing gap that undergarments companies should try to tap? Shouldn’t these companies appeal to every individual’s ‘dormant’ desire of living the life for himself or herself for a change? Bedroom? Assuming a normal person sleeps for 8 hours, we spend atleast 9 hours there. Now the critical question: which part of our house do we spend maximum on? Undoubtedly it is the drawing room, right? We spend the most on that part of the house where we don't even spend our maximum time. Compare the money we spend on the drawing room sofa sets and their smooth velvet cushions with the amount you spend on the bedroom mattresses and pillows. Guests come and sit in the drawing room. That is the place that needs to be at its best then. Why should we spend on our bedroom where we go only to sleep? Isn’t it a stark contrast that speaks volumes of the neglect we subject ourselves to? Don’t we pay the price of this through stiff neck at best and spondylosis at worst? Isn’t this the kind of gap that furniture and mattress companies like Ikea need to tap? As a society, we’ve evolved giving too much importance to others. We grew up getting conditioned to doing what our parents recommended and not doing what they forbid us from doing. Parents learnt those lessons from their parents and so on. But the essential basis of all those dos and don’ts has been the perspective of others towards our actions. People in our society have evolved wondering what other person in the society would think if they do this and not that. This overbearing importance given to others has forced us to undermine the importance we ideally should’ve given to ourselves. Somewhere, the huge disparity in our spending on our personal comfort through undergarments vis-à-vis the outer clothing or on our personal feel-good factor through bedroom spendings vis-à-vis those on drawing rooms is a fallout of this societal psychosis. How much would the following people cost per month? Now compare and contrast all these against the cost of a housewife. Ergo, can the contribution of a housewife be considered as the sum total of all the above costs that you save? What about the intangible gain of peace of mind that comes from not having to worry about these scores of daily chores which helps you focus better on your core competence which is to become an efficient bread-winner for the family. Pardon me for the crudity of the comparison. While comparing the monetary value of house-wife is the last thing one should do, this comparison nevertheless brings out the stark contrast like none other. If only we could realize the qualitative value that a house-wife brings to our life, we would start looking up to her and give her her due rather than relegating her to a position of nonentity. The housewives themselves need to realize what they’re to the family. That would help them value their self-worth and respect what they do. Marketing helps change people’s outlook. Certain things were never meant to be a certain way. But societal dynamics force people to make rules out of exceptions and vice-versa. There are always some innate human desires curbed under societal forces. Companies that identify such rules that conflict with the innate human spirit need to bring out and emancipate those souls hankering to break the shackle by attacking that dormant, implicit need. Companies need not go too far to innovate in terms of new products that generate newer needs. There are enough dormant needs that are curbed under the societal forces. The sooner the companies target them, the happier the society at large would be. Well, we are in Singapore now. Here are the latest updates in a nutshell. Both the Dubai and Singapore Cohorts have now swapped campuses smoothly as per plans and are all set to begin our 2nd term in their respective 'classy' cities. The Dubai batch landed in Singapore first on 19th November, both the batches spent time together for about 2 weeks. This was the time when we interacted personally for the 1st time and got to know the diversity in the entire Batch (we’ve a lawyer, a doctor and one from the Merchant Navy too). And then it was time for the original SPJCM Singapore batch to bid Goodbye to Singapore and fly off to Dubai for the next six months... Sounds interesting, doesn't it? Probably, no other college in the world follows this model of exchanging its own mba students across the two most vibrant economies of the world. Before coming to Singapore, we flew back home from Dubai for a very short 14 Day break, completed our SGP formalities, met up with some friends, did some pre-departure shopping etc... and finally landed in Singapore on 19th Nov. But hey! What else did we do after coming to S'pore? Hmm... Well just one thing that comes to our mind. Explored... explored... and just explored this tiny little but extremely well planned City State. And let us tell you; it was FUN!! The Beautiful College campus (featured above is the library building snap taken from a 6th floor Hostel apartment), VIVO city Mall, Harbor Front et all... Singapore is very much like India and its so much 'Unlike' Dubai. Even the names of some places are like India... Crawford Market, Little India, Dhobey Ghaut, Hyderabad Road and Mustafa Market to name a few. Singapore is such a happening place. It rains a lot and yet there is always something happening all the time. We also got a chance to have very informative interactions with a lot of Students from various nationalities studying at leading Universities like NUS, NTU and they have helped us in understanding the local culture better and very quickly. Singapore feels like a home away from home. It definitely has something that makes you feel at home... that welcome feeling which you will only get in some serene Indian cities like Pune, Bangalore etc. That's it for now... We will keep you updated. P.S. : Here's the link to some snaps I uploaded on Yahoo! Photos... Check 'em out. and here for Easwar's snaps! 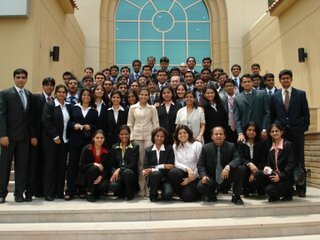 Our 2006-07 batch of SP Jain is halfway through the designated one year Global MBA program. We’re done with our stint in Dubai and are taking a much needed break in India before we move on to Singapore for the second and last part of the program. Our last term was grueling to say the least and going by what our Dean Dr. Vijay Sethi says, our stay at Singapore is to beat Dubai stint by miles, for now we’ll be robbed of even the weekends that gave us a little bit of a breather in Dubai. And what a learning it has been! Just yesterday, I was discussing with my brother, a commerce graduate, the Macroeconomic nuances of pegged and floating currency. While that might just be a fraction of the ocean that Macroeconomics is, the discussion was something I couldn’t have done without undergoing the Dubai SPJCM experience. It has been a whirlpool worth being sucked into. However, was there anything we could’ve done differently? Was there anything that we students as a batch could’ve handled better? The answer is an unequivocal ‘yes.’ We need to change our smug ‘know-all’ attitude towards soft-skills courses and those that deal with Human Relations. The problem, according to me, is that we perceive them to be synonymous to Communication Skills. And isn’t our selection into one of the premiere B-Schools of India proof enough of our good communication skills? After-all, didn't we all take exams like CAT, GMAT, wrote case-studies and essays, underwent Group Discussions and Personal Interviews to get selected for this program? A pretty comprehensive selection procedure I’m sure all would agree. May Hell unleash its fury now on the imprudent soul that still doubts our communication skill. But it is this very haughty attitude which is our undoing, especially because communication skill is just a part of the whole and not the be-all and end-all of it. Our program at SPJCM entails us to work in three different groups for different purposes. The first one is a special project group for which we have the liberty to choose our team within the first couple of weeks of the commencement of the program while the other two groups are preselected for us. This group is more coherent since people generally handpick the ‘apparently’ better students of the lot. But such a selection has two problems the first of which is a proverbial aphorism – “Don’t judge a book by its cover.” The second problem is that people tend to choose only those they are comfortable and friendly with. So, the friendly, humourous and fun-to-be-with people get picked up faster while those perceived to be nagging, inquisitive or overly-studious are left out. This precept sometimes falls flat on its face because of the second rule, “The most sincere and knowledgeable people are not often the best people to hangout with.” Students realize their fallacy when they find that people who are pompously fun-to-be-with are not the best assets in a team. Flamboyance, in most cases, ends up being antagonistic to sincerity since the people who actually work in a group are rarely high profile. It is here that the group formed from the “left-overs” who were partners more out of compulsion than choice do a better job by working silently and sincerely, as is their wont. The other two groups are pre-selected and hence more heterogeneous, both in terms of experience and attitude. You need truckloads of serendipity to end up with a good group where almost everyone contributes. However, it’s only human to have a black-sheep in a group of six. All these above groups work on various assignments that have atleast one deadline per day. Every choice is a trade-off here. You can’t choose to work with one group without antagonizing another. You can’t please one without relegating the other. You can’t continue neglecting one for long lest you be seen as a worthless moron. Life, in the middle of all this, is a huge management game in itself. It is here that the Soft-Skill and Organization Behaviour courses pitch in. Every time a team member chooses to work for a different group, there is a conflict. Motivating them to work for you is no mean task. God save the groups whose members fall in love with one of the batch-mates. No amount of coaxing, rebuking or imploring can get them out of their self-imposed honeymoon for they prefer to stay in that self-denial state of romantic hangover. Then there are some who just don’t want to work. Then there are some credit-mongers who join the group when it’s time to stand on the podium. So, what do you do for them? How do you get them to work for you especially when you’re only his peer and not his boss? These are the very issues of conflict and motivation that you face in corporate life. The B-school environment is a fantastic learning ground for such things. But in our self-righteous myth of omniscience for soft-skills, we fail to gauge its importance. Consequently, not a single group succeeded in motivating the Non-Performing Assets (famously called NPAs) of the teams. There, according to me, lies the single biggest scope of improvement for the batch. The Indian schools and Undergraduate Institutions are partly to be blamed for laying no emphasis on teamwork. We need to inculcate the importance of teamwork in children at an impressionable age. In their quest for ‘individual’ marks and grades, Indian students have forgotten to work for the holistic good. It is amazing what you can achieve if you don’t care who gets the credit. But in the corporate world, your progress depends on your visibility. So how effectively you balance the two contradictions will decide how far you go. We still need to ensure that we communicate to our teams that while claiming credit for something is welcome, plagiarism is not. Soft-skills, ironically, have a very important role to play here. I am Kamlesh Acharya. Simple, isn’t it? But am I really the name the world knows me with? I guess not. So? Am I the physical body that moves around various places on earth? Not quite. I think I’m something deeper than the body. Am I the mind? Well, may be. But at times my mind works even when I sleep; do I then say that I’m working? I guess I’m not the mind then. So am I the soul? Well, may be; may be not. While these questions always rustle in my monologues, I don’t quite know how to answer them. 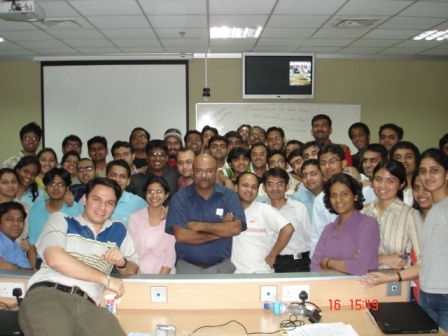 On 4th Aug 2006, Prof Debasis Chatterjee from IIM Lucknow visited SP Jain and took a guest lecture on leadership. While his leadership talk was inspiring, what grabbed the students’ attention most was the high Spiritual Quotient of his speech. He spoke fluently as if reading from a book; being an author of a few books would’ve definitely helped clarify his thought process. He delivered the lecture from his heart and brought the crowd to a mesmerizing introspection through his true words, insightful speech and a high SQ’ed visage to corroborate. Throngs of students just swarmed him after the lecture got over - something I had never seen in any of the previous lectures even when the guests were equally impressive and scholarly in their domain. I believe the difference here was that Prof. Chatterjee managed to touch a chord of our dormant self somewhere and the swarm supported this thought of mine. I was a part of that crowd and a mute spectator. I saw fellow students talking to him, barely able to control tears of joy in their eyes as others simply observed him and gathered the pearls of wisdom that fell from his mouth. I was pleasantly surprised to see so many people impressed with him. Like an avid businessman looking for an opportunity, I realized that the iron is hot and waiting to be struck. So, Dhruv Patel, Kush Bohra and I invited our batch-mates to form an esoteric group of people ready to introspect and look within for answers. A digression of thought is warranted here. Be it in business or otherwise, isn’t MBA all about finding opportunities for what you want to do and executing your plan when it can yield the most? We roped in Prof. Mala Kapadia - our Human Resource Management professor – to lend authenticity and discipline to the group by forming some ground rules. She was more than happy to oblige. She took our first session and forced us to think deeper and introspect harder. She left us wonderstruck with her simple logical flow of thoughts. Through this group and our meetings, we might not know ‘who we are.’ But by sharing the knowledge with each other, we end up learning a lot from others’ thoughts. Through these sessions, we might not reach the core of true knowledge but we’ve started gnawing at its peripheries for sure. An interesting incident to end with. I offered to take the first session of “Who am I?” after Prof. Mala. I called my session “Demystifying God” and sent a mail across to the group. An eager beaver I met thereafter told me that he found the topic really interesting and wondered what I’m going to talk about. I told him to wait and watch. The impatient guy that he was, he told he would search for it. Before I reveal my reply, a small digression to surprise you is not uncalled for. Our Marketing Management professor Mr. Ramkumar told us some statistical facts released by Google. P.S. One of the subjects that is setting tongues wagging at Harvard Business School is also on the same lines. Isn't it wonderful that what is taught by professors there at Harvard is a student initiative here at SP Jain? Check out. A sneak peek for the world outside into the ways of life at S P Jain Centre of Management at Dubai and Singapore and what goes behind the scenes to make it happen!! It is now a little more than two months since we landed in Dubai (8 June 2006 to be precise). On one hand, it feels like ages for we’re going through one of the busiest phases of our lives and on the other hand it doesn’t seem to be anywhere even close to two months at all, thanks again to the rigors that ensure a steep learning curve. Time just seems to fly by at SPJCM… We’re already on our way to becoming lifetime friends, not to mention building networks. In this latest update we try to describe how a typical day is spent at the Dubai campus (the update from Singapore will follow soon). A typical day begins at 7 AM, with classes starting as early as 8 AM. The early morning rush to get ready for college is something that deserves mention over here. Mathematically speaking, the speed of getting ready is inversely proportional to the time left for boarding the college bus. :-) The necessity of boarding the bus becomes the mother that helps us discover our hidden potential. In fact, some amongst us have become experts in the art of getting from bed to bus in five minutes flat. God bless the inventor of Deodorants! And then there are some more running to board the bus, with laptop in one hand, belt in mouth and tucking the shirt in with the other hand giving us a live lesson in multitasking that we learn outside our classes. Classes are a completely different story though. The exhaustion and rustiness suddenly vanish into thin air as we hear of ‘surprise Pre-class Quiz.’ Post Quiz, we get to see some ‘excellent Class Participation (CP)’ which in some cases borders on Desperate CP to earn some brownie points. At this point, we must add that the faculty flown in from SP Jain Mumbai does a commendable job of teaching us and more importantly keeping us awake through their interactive sessions. Typically classes end by 5 PM. Occasionally; however, we’ve guest lectures by industry stalwarts after the classes as a part of Visiting Wisdom Sessions. Whether external wisdom visits us or not, the professors ensure that we get wiser every single day. A few more such days and we hit a weekend, full of hope for recharging our batteries. Our weekend is Sunday & Monday, the two days dedicated for the Special Group Project (SGP) with companies like Microsoft, TCS, Infosys, Emirates Bank and many others. Truly, time just seems to fly by. We’re two months old cohort and we’ve just three more months left before we end our tryst with Dubai and move on to Singapore. There is, however, much more midnight oil to be burnt before we take the break and many dunes of wakefulness to cross before we reach the oasis of sleep. Today please .. please ... lessen my dread ! -Kamlesh Acharya & Amardeep Grover Entertainment Co. When dreams turn to reality, the first reaction is of disbelief. Then comes the realization that you’re experiencing what you’d always dreamt of. And yet, the feeling is mixed. The ecstasy is overruled by fear; a fear that you somehow don’t belong to the place – a fear of failure; what if you don’t prove yourself from hereon? It’s a proud feeling to be chosen to represent some of the brighter brains and smarter people of the lot. And yet, it is a humbling feeling; humbling - for no matter how smart you’re - you always have someone smarter than you here. No matter how intelligent you’re, there is always someone more intelligent than you here. Every brain has a better half here. Every pride meets its vanquisher here. Every wit has a repartee here. I had always dreamt of doing an MBA from a premier B-school. After quite a few years of toil and unsuccessful attempts at entrance exams, I made it to SP Jain Dubai. Having worked with IT industry for a few years, I had seen IT industry from close quarters. Through projects, products and consulting, I had seen IT vertical at the micro level. I now wanted to work at the macro level. I was sick and tired of being directed by the organization; I now wanted to direct the way the organization went. I left my home in India on my birthday. That might not seem too emotional a farewell until you know that I was spending my first birthday in ten years with my family. As fate would have it, I just couldn’t have left a day later – or earlier – as the session was starting soon thereafter. So here I was in Dubai; dreaming, like everyone else, and visualizing how it all is going to turn out. The next day, Sudeep Jain, my batch mate, took me to the college and then to the hostel which actually is a villa. Then started the real nightmare. I was the first person to arrive in the by-now-infamous ‘blue’ villa. The villa was being readied for the students who were to arrive that night and the preparation were running late even for them; I arrived that afternoon. I entered the premises of the villa to a shocking sight of carpenters and labourers going about their business. If it were not for the girls accompanying me to show me the way to the villa, my entry would not have surprised many and I would’ve been mistaken for another labourer at best or would’ve had to share their load at worst. I felt like a chief guest who arrived for the function before time. After a few hours of moving around like a zombie, I got some water to drink and freshen up. By late evening a group of about forty guys arrived in the villa and it suddenly was not a bad place to be in. But that by no means was the end of villa ‘blues’. For more than a week we had a torrid time in the restrooms. I once had to ask my roommate to pass me drinking water bottles so I could wash the soap foam after the shower had so dramatically stopped when I needed it most. Restrooms were never the reason we prayed so hard. Luckily the prayers were answered and water never played truant when I was on the closet. The sale of deodorants in the adjoining grocery had suddenly seen a spurt. But thanks to our woes, I learnt some early lessons in economics – outside of my class: The increase in sale of a commodity may not always be due to excellent strategies of companies but due to unexpected exigencies of totally unrelated societal dynamics. Our dean Mr. Vijay Sethi had, on our first orientation day, told us – perhaps very intentionally – to look at the bigger picture and ignore the teething problems. This advice stood us in good stead, for the administration issues put a shoddy picture in the initial week but the professors at the same time were excellent to say the least. I didn’t get worked up for I wondered what my condition would be had it been the other way round. The professors at SP Jain Dubai need a mention here. They are sincerity and commitment personified. This stands true atleast for those we’ve seen in this short span. 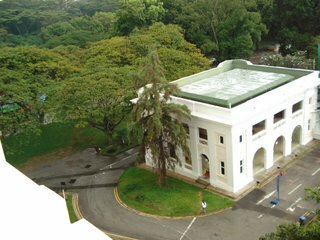 I was talking to an alumna the day I arrived at SP Jain and she told me that the best thing about this place are the professors. And I thanked heavens. A man of knowledge is of no use if he doesn’t know how to impart knowledge. The assignments, tests and group works ensure that we keep awake till late in the night. We have pre-session tests that ensure we read our stuff so there is a better class participation. But that also means, we’re kept on tenterhooks. We both were shocked to realize that it had been only three days since the classes started. And it looked like we hadn't slept for ages. I was to learn another management lesson the hard way. My earlier stint here in Dubai got me in touch with a few good caterers. I approached one of them to deliver food in the campus. He charged a very reasonable Dhs 5 a meal. It so turned out that he delivered so much in one meal that we ended up sharing the meal. There was such a downpour of people taking the meal that a lot of those who paid had no meal left for them. I started supervising the distribution but to no avail. I did not take lunch for two days so others who had paid could eat. It took me three days to realize the discrepancy and solve the problem. Now the students eat a meal at Dhs 2.5 which by all means is cheaper than what we get in India. I struck a golden deal for them; the flip side of this achievement was that I became so famous for food management that I was hand-picked for food committee instead of the ones I would’ve loved to be a part of. The new batch has arrived and this batch of 2005, which will never be succeeded as ours was the last PGDM batch, has joined the corporate world and we hope to shake it. The GMBA batch has arrived in Dubai and Singapore will be starting from the 1st of July. I would like you guys to be introduced to the new guy in charge for this blog (obviously we will be pitching in too like guest columnists). I admit we did not do well to maintain this blog. So, I hope this new batch does it and I am sure they will do it very well. The responsibility of this blog now resides solely on the shoulders of Kamlesh Acharya, who is the first guy from the GMBADXB06 batch (ya, thats what they call the batch which is in dubai right now) who expressed an interest in running this blog, so thanks to him I did not have to find a scapegoat and thrust the responsibility on that person. Kamlesh runs his own blog - Mind Monologues. Do visit it. So, this is Venkatesh, PGDM A 063, batch of 2005, S P Jain Center of Management, Dubai signing off as the chief blogger for this blog. I would like to thank my batchmates who were part of this. Ciao and here is a toast for a new beginning!!! !